Are you looking for reliable aircon repair in Singapore? If you are facing aircon problems such as aircon not working or have malfunctioned, it is best to have your air-conditioning system repaired so that you can continue enjoying the cooling air. Professional air-conditioner repair company can help you in diagnosing the aircon problem that you are facing and regain the functionality of your units in an efficient manner. There are many inconveniences and frustration when your air-conditioner is not functioning well, hence, the only solution is finding AC repair service in Singapore to resolve your issue. When you engage our repair service, our technician will check the problems that you are facing with the use of appropriate tools and equipment. After checking the units, our technician will diagnose the cause of the problem and identify the fault. With the diagnosis of the issue, our technician will advise our customers with the most economical solutions and repair the aircon efficiently and ensure that the units are working properly and continue providing cool air to our customers. At Wei Wei Aircon, our technicians are all well trained in different models and brands of air-conditioner in Singapore. Hence, you can trust us in rectifying and repairing your aircon problems efficiently. There are cases where, either the problem of your unit is facing could not be repaired, or it may not be cost effective to repair the units. If you are facing such issues, you can engage us in our repair service and our technicians will advise you on the most economical solutions that is able to suit your aircon needs. If you feel that your air-conditioning system is not running efficiently, but it seems that there is no fault in your unit, you can still engage in our service. Our technician will have a thorough check on your air-conditioning system to identify any possible faults, get it rectified and improve the operating efficiency of the unit. When your aircon encountered breakdown issues or have malfunctioned, there are actually many factors that have contributed to it. For example, it could be due to an excessive accumulation of dirt and debris or faulty parts or electrical fault and much more. Other than that, it could be due to the life-span of the unit as the older unit tends to have a higher possibility of facing breakdown issue. Regardless of which aircon problems your units is facing, we have the appropriate tools, knowledge and most importantly, professional and experienced technicians that are able to resolve and rectify your aircon issue. Other than aircon repair service, we provide other aircon services that are able to meet your aircon needs in keeping your units in good working condition. We provide yearly aircon maintenance contract or one-time aircon servicing maintenance where we will clean and at the same time perform regular checks on your units to ensure there are no issues with your system. In our aircon maintenance, we will clean the different parts and components in your aircon system such as the filters, coils and many more, as well as inspecting the necessary electrical parts. It is important to keep your units regularly maintained to prevent the accumulation of dirt and dust that could affect the performance of your units. If your existing aircon units are too old or you are moving to a new house, we are able to provide aircon installation services. We are able to install most air-conditioning brands in Singapore and types of air-conditioner depending on your needs and by installing the most up to date air-conditioners, you are able to enjoy the coolness in an efficient manner and even switch on or off the unit with smart controls. Are you looking for reliable air-conditioning repair company in Singapore? We all understand the unbearable heat in Singapore especially when the air-conditioner is not producing any cool air or not working at all. If you have switched on your units for several hours, but discovered that your room is not cool at all, this is a sign that you may need to call professionals to have a thorough check on your air-conditioning units. Since there are many aircon companies in Singapore, you should make the right choice in choosing the repair company for your air-conditioner. So why should you choose us to repair your aircon? Companies that have expertise, experience and have been in the industry for years are the type of company that you should hire for the best aircon repair service. Other than that, technician is also an important factor, where the technicians should have proper training to provide satisfactory and quality repair job for the customers. Adequate training is essential in maintaining the quality of the work which will increase the customer’s satisfaction in the repair job. Before you are looking to hire an air-conditioning repair company in Singapore, you should also find out and understand what is the type and brand of your air-conditioner. This will aid you in finding appropriate and suitable aircon contractor that can repair your units professionally. I am sure you do not want to hire someone and only discovered that they do not provide repair jobs for your air-conditioning system when they reached your home. Simply by checking out the websites or calling the staff to enquire about the repair job will save you unnecessary troubles. So why choose us as your repair company in Singapore? We are one of the qualified air-conditioner repair company in Singapore, all of our technicians are well trained in different brands and models of air-conditioner system. 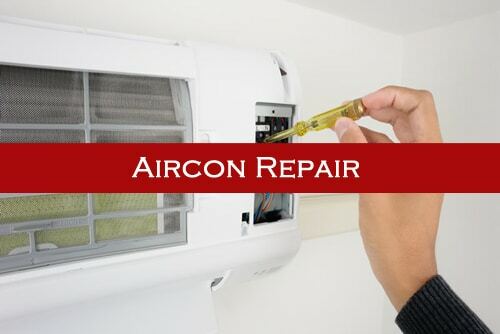 Thus, with the experiences in repairing different brands and types of air-conditioner, we are able to diagnose and rectify your air-conditioner problems in an efficient manner. With our experienced, professional, and knowledgeable technicians, we believe that we are able to meet your air-conditioner repair needs in Singapore. We understand the frustration and troubles when the first thing you reach home is to discover that your air-conditioner is not working at all where you should be enjoying the cooling air instead. Hence, with just a phone call away, you can contact our friendly staff to book an air-conditioner repair appointment with us and get your aircon fixed today. Our technicians will discuss the issue that your system is facing and advise you on the possible solutions to get your aircon repaired efficiently so that you can relax and enjoy the cooling air when you reach home. We understand the busy schedule that you are facing and we will definitely work around your schedule to provide the repair job so that your daily routine is not affected. When you happened to encounter aircon problems such as aircon not cold, aircon switch on and off problems or other issues, you should get your air-conditioner problems rectified immediately. This is to prevent worsening of your aircon problems or other parts from being damaged. If you are looking for qualified air-conditioning repair or want to find out the price of repairing your aircon problems, feel free to contact our staff for assistance. You may feel that you could perform the repair jobs on your own. However, it is a dangerous task to repair your aircon individually as air-conditioners contains many electrical parts that could endanger your lives. Also, it requires experience and knowledge to repair the aircon professionally and safely. Thus, with the help of our technicians in Wei Wei Aircon, we are able to diagnose the fault of the problem and get it rectified while you continue to relax or work in a cooling environment. If you ever feel that your aircon is having problems and require aircon repair services in Singapore, do not hesitate and contact us for your repair job today. We believe with our experienced and qualified teams of technicians, we are able to accurately diagnose and rectify your aircon problems and regain the functionality of your units. Contact our friendly staff today for our repair services.